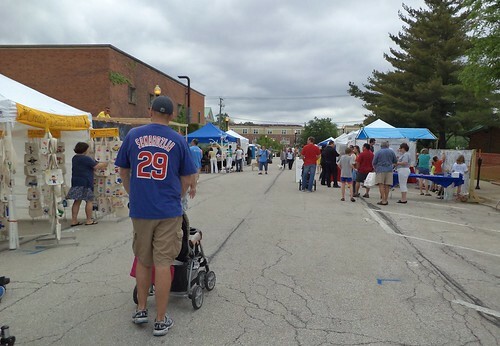 Wheaton has been holding this festival, entitled Cream of Wheaton, for a long time. The Chamber of Commerce and the Park District combine to sponsor the event. It's free and held in and around Memorial Park which is just north of downtown. I've decided that part of getting back into life is to attend things like this which have little to no cost, other than gas and maybe parking, depending upon where it's located. Plus, I was looking for a gift for a friend, a specific gift, and I knew Cream of Wheaton had an arts and crafts component to it. Memorial Park is where the Disney Channel set up a radio broadcast. It's also where businesses in Wheaton or serving Wheaton were invited to rent a spot and hawk their wares. My impression? This is the most boring part of the event. There must have been at least a half dozen tents offering massages and chiropractic evaluations. There were banks. There were insurance agents. There were city departments and representatives of the garbage service. There were places where grade school kids could make posters and the Park District had a long table advertising their programs. The guy advertising the Wisconsin Dells would not take "No, thank you" for an answer so I filled out his entry for a free weekend. Is it bad that I put the phone number of the old Internet line that I had discontinued back in March? I'd take a free weekend, but I am not interested in having sales people call. The arts and crafts part of the festival was very interesting. There were two blocks of tents. I found what I came for in this section. 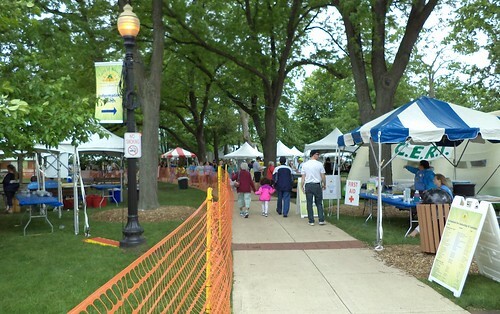 Along here was a tent for Wheaton College's "Artist Series" concerts. I've seen some very good performances at Wheaton College over the years. At the far right, above, you see some kids coloring on a large mural. It was an advertisement for Wheaton's Cosley Zoo. You could color on the mural and then get a free photo of yourself with the mural. Well, I suspect it wasn't completely "free" as the photos were sponsored by Allstate. Here's the other block of tents, right around the corner from the above. I found the cat toys in this group of tents. The gals who made the cat toys also had some very nice wallets. They had one in a dog print. If they'd have had a cat print, I'd have purchased it. They took my email and are supposedly going to contact me with prices for making a wallet in the cat print. I'm also kind of kicking myself as the statuary display at the far right had a couple of things my brothers would like. 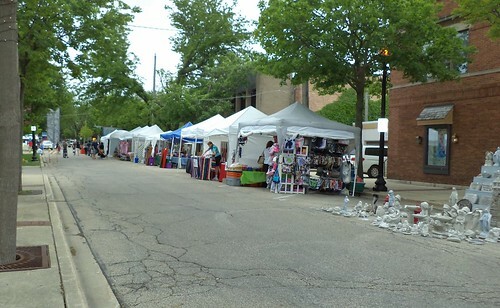 There was music in the bandshell in Memorial Park from the Disney Channel and music in front of the old Wheaton Theater from local musicians. 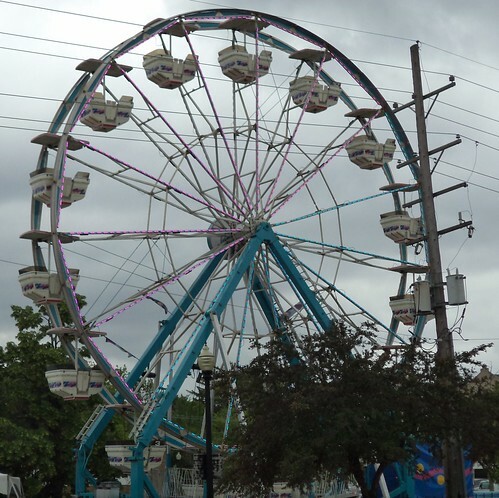 Carnival rides were stretched from Hale Street to Water Street. Although it was cloudy, it was reasonably warm. The carnival "opened" at noon and they were in the final stages of getting things set up when I wandered by. The festival managed to stay dry until 4:15, when the skies opened and it poured. You can't help but think about the vendors out in the open or people who might have been on the Ferris wheel at the time. I walked a fair chuck on Saturday. It was a fallacy to think there would be any spaces in the downtown parking garage so I didn't even check. Plus, so many streets were closed for the carnival and for the vendors that even getting around downtown required patience. I parked 5 blocks away and walked. It was an hour and a half on my feet, in good shoes, mind you, but my left knee let me know it wasn't very happy. The next day, I certainly felt the repercussions of all that walking. Still, this is a good thing for me to do, get out and go to these things. Even if all I get are 3 catnip mice for $2.00, it gets me out and moving. This coming weekend is the Printer's Row Book Fair in downtown Chicago. I know. I know. I don't need any more books, but that's, technically, not the point. There is a free festival somewhere every weekend between now and Labor Day. The point is to get out of the house and do things. Festivals are the way to go.